Since archaeo-historical times, the geography of the region around Tomar has been conducive to human settlement, with the valley and topography emerging as key factors in attracting people to the area. The "morro de Tomar" - castle hill - gave the nabantino valley particular strategic significance as a defensive stronghold, especially at times, right up until today, when the regional landscape was still being moulded according to the organisational systems and processes of the centres of population. In protohistorical times, therefore, the indigenous communities of the region inhabited the castle hill, or fortified enclosure (oppidum), as evidenced by the material remains of varying significance, though these are insufficient to establish how and to what extent the area was occupied. Eventually, the Celtic enclosure or oppidum was Romanised and incorporated into the town of Seilium (Tomar), within the Santarém administrative region (conventus scallabitanus). The urban layout of the oppidum was altered to house the Forum at its centre, built during the reign of Emperor Augustus (16 - 13 BC). This architectural complex, with the River Nabão running through it and the castle hill to the west, consisted of a regular right-angled structure. 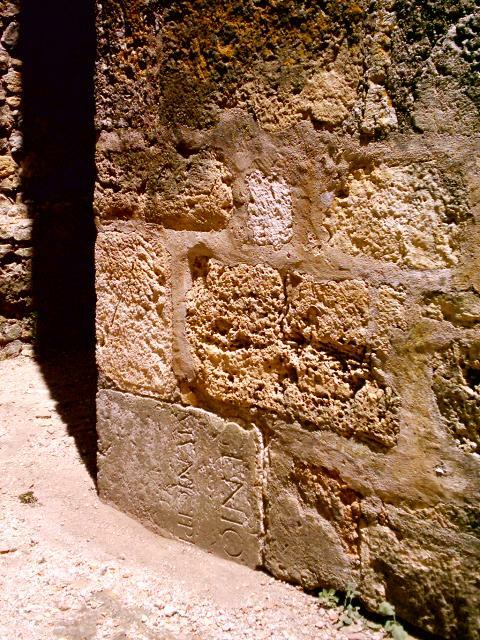 The series of stone epigraphs and iconographs carved into the walls of the Torre de Menagem depict the life and death of the people of the Roman settlement of Seilium. The dedication to the GENIO MUNICIPII, dating from the second half of the 1st century AD, indicates that Seilium was elevated above the other towns in the conventus to the status of a municipality during the Flavian dynasty. The other Roman epigraphs allow us to glimpse aspects of daily life in the town (close-knit families, religious worship, and the memory of the dead). Alongside these stone records, there are other more recent ones which reveal, right up until the Christian reconquest, the various uses of the "hill" in the new structures built to reorder the region: the Romano-Visigothic ornamental plaques (5th/6th-7th cent. ), stylistic and geometric in form, from Christian buildings (Selio/Celio); and the Moorish construction and architectural details (8th to mid-13th cent. ), in places scattered around the "emerging architectural complex" and in others used as foundations for buildings from the later Middle Ages and early modern period. These (non-)material records allow us, like an open book of construction styles with their indelible markings and memories, to gain new insights into the region's living structures, both based around the sacred power of the Christian cult (Romano-Visigothic) and as part of the rural and peripheral area of the Gharb-al-Andalus - the Islamic world of the communities of the upper and lower Tagus, between it and the River Mondego. Finally, the material culture and the residual structures detected in the fortified enclosure, more exactly in the area occupied by the old palaces, Paços Antigos, (15th cent.) and new palaces, Paços Novos, (16th cent. ), allow us to identify a little of the size and layout of the buildings in the Moorish citadel. The remains uncovered here enable us to identify the madîna (city) of Thamara or Tamarmá (9th-13th cent.) on the hill on the right bank of the river, a privileged and strategic spot overlooking the land. According to Arab sources, the name 'Tamarmá' refers to the River Nabão (the deity Navia or Nabia/Nabiam). The madîna of Thamara or Tamarmá (Tomar), incorporated into the Kûra of Shantarîn, developed as an important urban centre thanks to the fertility of its land and the cultural and technological innovations introduced by the Moors.